Several weeks ago I signed up for my first CSA (community supported agriculture). A CSA is a wonderful thing. (If you are in the Phoenix area, this is the one I use.) I have been so impressed with everything about this. Once a week I pick up a large paper bag filled with 8 different things. It is mostly veggies and occasionally some fruit. Everything is organic, local and SUPER fresh. Another reason I am loving this is that I am receiving things that I normally wouldn’t buy or even think to try. One week there were dandelion greens in the bag. I had never tried them before and for that matter have never seen them for sale anywhere either. We tried them and liked them. It’s been fun for me to figure out what to do with the variety of foods I receive each week. Last week I received a squash I had never seen of, nor heard of, before. It’s called an eight ball squash. The first time I made them I stuffed them with a meat/veggie mix and covered them with a vegan “cheese” sauce. It was pretty good but not blog worthy. I got more of those squash this week. On a whim I came up with this. It was so incredibly good! My very picky four-year old said, “they don’t look very good but they are YUMMY!” I was honestly stunned. She ate 3 of them! They are simple, low carb and very satisfying. I fried these in lots of bacon fat which added a lot of flavor to a relatively bland veggie. You save your bacon fat, right? That stuff is like gold! Since most people probably don’t have eight ball squash lying around you could use yellow squash, grey mexican or zucchini too. They taste very similar. I served them with a Vietnamese style dipping sauce. 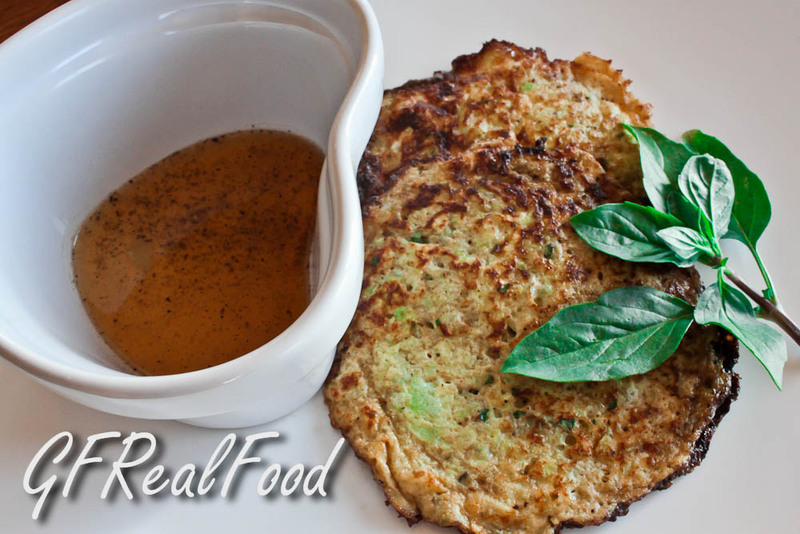 These savory pancakes are low carb, GAPS legal, grain, soy, dairy, corn, and gluten free. See mom, here is another grain free breakfast! Slice squash in half and scoop out the seeds. Then with a veggie peeler, peel the skin off. Cut in large chunks and place in food processor. Pulse briefly to a coarse chop, then add eggs, salt, pepper and basil to bowl and process again until well combined. In a preheated cast iron pan add 2-3 T bacon fat. Then scoop egg /squash mixture out in 2-3 T heaps. Fry on med – med/low until eggs are set and the bottoms are browned. Carefully flip. They are quite tender so you really need a lot of fat in the pan so they don’t break apart due to sticking. Cook the second side until browned. Remove from pan to a plate lined with paper towel to soak up any extra drippings. While you are frying the rest of the pancakes mix all ingredients for the sauce in a bowl. Serve together while pancakes are still hot. 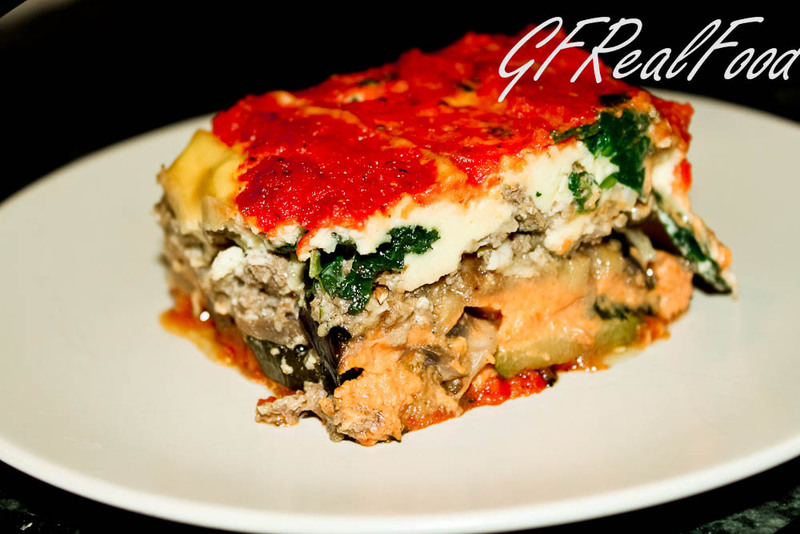 This recipe has been shared at Monday Mania 6/6/11 @ The Healthy Home Economist. I got this idea in my head to do a lasagna. It would have to be free of grain, gluten, dairy, soy, corn, citric acid, brewers yeast. No problem right? Actually, it wasn’t hard. Time consuming, absolutely. I won’t kid you there. Honestly, it took most of the day. In the end it was more worth it than anything else I can think of. It made a huge pan so there were leftovers for days. As I write this I am making it for a second time so that I can freeze it and then take it with us on vacation in a couple of days. We are going to San Diego. We rented a condo on the beach so that I will still be able to cook most of our meals. Eating out isn’t really an option so I need to make stuff ahead of time. Along with this lasagna I am making a no bean paleo chili, my Banana Pecan Muffins, NutBars, beef jerky, honeyed almonds, fruit leather, bread (for the kids), Almond Chocolate Chip Scones, Brownies, Almond Rosemary crackers, Chocolate Power Balls and chicken liver paté. We leave in 2 days. I have so much to do that I am feeling more than a little overwhelmed. So why am I sitting at the computer??? I have to get moving. Here is the recipe. I do hope you will give it a try. I bet you’ll love it! If a vegan or vegetarian meal is what floats your boat I think that this would work great if you omitted the beef and eggs. I have not tried it so I can’t say for sure but would bet it would be great. In a large bowl add cashews and cover with water. Soak for 6-8 hours. Drain and rinse. Add cashews, lemon juice, salt and water to blender. If you have a Vitamix this will go really quickly. If you don’t have one a blender works just fine. Blend until smooth. This takes several minutes. Be patient. It really does get as smooth as sour cream. Add the eggs and blend to combine. Pour into a bowl, cover and refrigerate until you are ready to assemble. Slice all vegetables to about 3/8 of an inch thick. Spread out on a baking sheet and drizzle with olive oil and sprinkle with salt and pepper. Heat BBQ/grill to high. Grill veggies in batches until they are soft but not mushy. Let them get a bit browned before turning them. The grilled flavor is amazing in the lasagna. The purpose of grilling is to not only add a ton of flavor to somewhat bland veggies but also to let them release their water so that your lasagna does not end up looking like soup. When veggies are browned and cooked removed from grill and set aside. Saute mushrooms on high heat in your fat of choice. When they are nearly done and browned a bit add the coconut aminos or S&P. Remove from heat and set aside. Heat saute pan and FOC. Add ground beef. Meanwhile add onion and garlic to mini food processor and process until it is chopped up fine. You can do this by hand too if you don’t have or want to drag out the food processor. Add onion, garlic, S&P to beef. Continue to cook until beef is cooked through and onion and garlic are cooked and soft. Pour into a bowl and refrigerate until you are ready to assemble. 1 tsp Italian seasoning (Without fillers. Ingredients should be only dried herbs.) Or use fresh chopped herbs if you have them, such as basil, oregano, thyme, marjoram, rosemary. Heat FOC in medium sauté pan. Add onion, carrot and garlic to mini food processor and process to a fine chop (or chop finely by hand). Add veggies to pan. Add S&P and saute for 5-10 minutes until cooked. Do not brown. Add tomato paste and sauté for a minute. Add Italian seasoning and approximately 1 1/2 can (tomato paste can) of water to pan. Let simmer for approximately 20 minutes. Let cool for a bit then add the marinara sauce back into the food processor. Process until you have a pureéd sauce instead of a sauce of visible veggie bits. Check seasoning and adjust if needed. Set aside. Heat sauté pan and FOC. Add spinach, salt, pepper and several grates of freshly ground nutmeg. Cook spinach down and continue to cook until all liquid has reduced. Remove from heat and set aside. This part is quick. Heat your oven to 350°. 1) In the bottom of a deep lasagna pan (I used a 12x8x3 inch pan) pour approximately 1/3 of the marinara sauce in the bottom and spread evenly to coat. 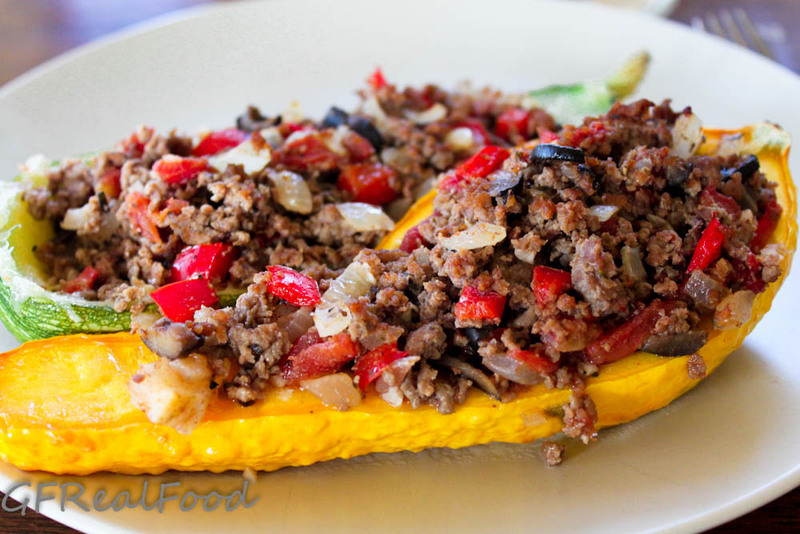 2) Using all of the squash, lay it flat to form an even layer. 3) Using all of the mushrooms create your next layer. 4) Combine approximately 1/3 of the cashew cream and the second 1/3 of marinara to create a pink sauce. (You have got to taste this. Think of the possibilities!) Pour this over the mushrooms as evenly as possible. 5) Using all of the eggplant create your next even, flat layer. 6) Evenly spread all of the beef on top of the eggplant. 7) Lay all of the spinach on top of the beef. Yes, you sort of have to lay it out piece by piece. 8) Pour remaining two thirds of cashew cream over the spinach. 9) Pour remaining third of marinara sauce over the cashew cream. Cover lasagna pan with foil. Bake at 350° for approx 1 1/2 hours or until it is heated through. Remove from oven and set aside for 10-15 minutes to let it set. If you can restrain yourself long enough this part really pays off. If you don’t wait until it cools a bit it will not stand up in pretty layers. Slice and serve. ***Since writing this we have returned from our vacation. I made this lasagna and froze it. When we got to the condo I left it in the fridge to thaw. Two days later I baked it at 375° for about an hour and a half. It came out just as good this way as it did the first time. This post was entered in the Monday Mania 5/23/11 over at The Healthy Home Economist. It has been a long time since I posted anything. Almost daily I am getting new subscribers (welcome everyone!) and the guilt of my inactivity has been mounting. I have to admit, I have been feeling less than inspired in the kitchen. As of December 1st last year we have made a committment to change the way we eat. We have cut out all grains, sugar and anything processed. Additionally, I have eliminated dairy. Dairy does not like me although I miss it terribly. Usually when I have restrictions I feel challenged in the kitchen and it sparks me into action. Not this time. There has been just nothing creative going on between my ears. Maybe it was the busyness of the holidays or the fact that we all got a horrible cold that has been lingering for 3 weeks. Anyway, I think I have come out the other side as I have been in the kitchen for 2 solid days. Yesterday I started some green beans with dill and garlic that I am lacto-fermenting. I’ve never done anything lacto-fermented before other than sauerkraut so I am excited to see how those turn out. I made bread (for the kids), nut bars (which I will post soon), Mongolian Beef, pot roast, coconut oil mayo and salmon. Tonight will be shepards pie. 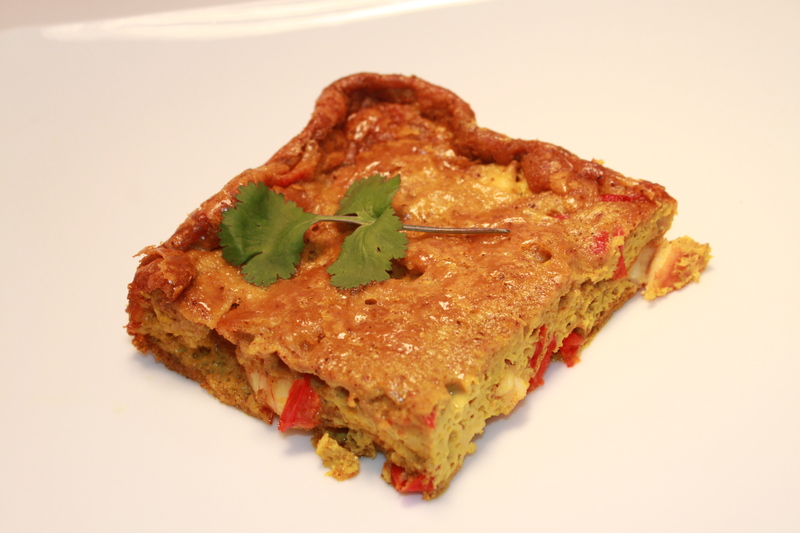 Today for lunch was this Shrimp Curry Quiche. 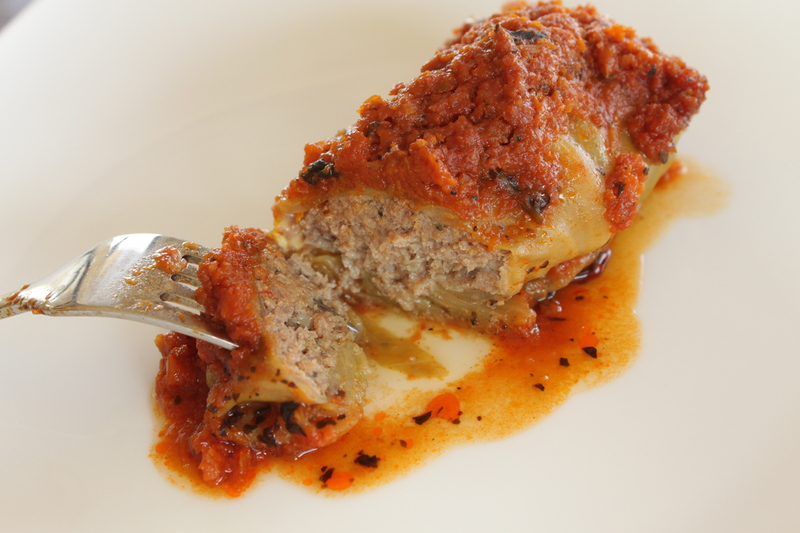 It was really quick to put together, flavorful, and filling. My four-year old who is quite possibly the most picky eater ever ate 2 big pieces. I had to hurry up and take pictures before we ate the whole thing. I think this would be great for breakfast, lunch or dinner and would be perfect served with a simple green salad. This is low carb, gluten, casein, grain free and has dairy free options. Preheat oven to 400 degrees. Oil a 7×11 baking dish with ghee or coconut oil. Set aside. Heat coconut oil in medium saute pan. Add diced red bell pepper and saute for 2-3 minutes. Add shrimp and salt and pepper to taste. Saute on medium heat for another 5 minutes or until shrimp are cooked through. Don’t over cook them, they will get tough. Remove from heat and set aside. In a large bowl mix eggs, ghee or coconut oil, coconut milk, curry powder and salt and pepper. I used a very mild madras curry powder so it is full of flavor but not too spicy. When curry powder is well combined add shrimp and peppers and mix. Pour into prepared baking dish and bake for 25 minutes or until center is set. Serve immediately. Since going gluten free do you miss great pizza? Is making pizza at home dependant on whether or not you have a mix in the cupboard? Do you hate the rise time needed for yeast based crusts? If you can relate, I have got the answer for you. This is my pizza crust recipe. It’s super quick to put together, requires no yeast and so therefore no rise time. It doesn’t have that gluten free bread texture (if you’ve ever bought gf bread you know what I am talking about) and I am betting that if you do any gf baking at home you already have all the ingredients in your pantry. Oh and did I mention that it is AWESOME!? A word of warning: if you like cheese you are going to LOVE this and it is really hard to have just one piece. We occasionally go out for pizza and while it is nice to eat out sometimes, it is really expensive. Just yesterday we celebrated my daughters 4th birthday and the bill at the pizza restaurant was $74 for just the 5 of us. YIKES!! Even when we splurge and eat out I hear at least once from someone who says the pizza we make at home is much better. I have to agree. It is much better! The last couple of times we made this we made 4 or 5 batches at once (maybe more, I can’t remember). I put Ron to work doing the mixing and the rolling while I measured and cleaned. We ended up with 18 pizza crusts to freeze. When we want pizza we pull a couple of these out, add the sauce and toppings and bake. They are ready to eat in less time than it would have taken to order in if we had that option – which we do not. Pre heat oven to 350 degrees. Combine all ingredients in a really big bowl. 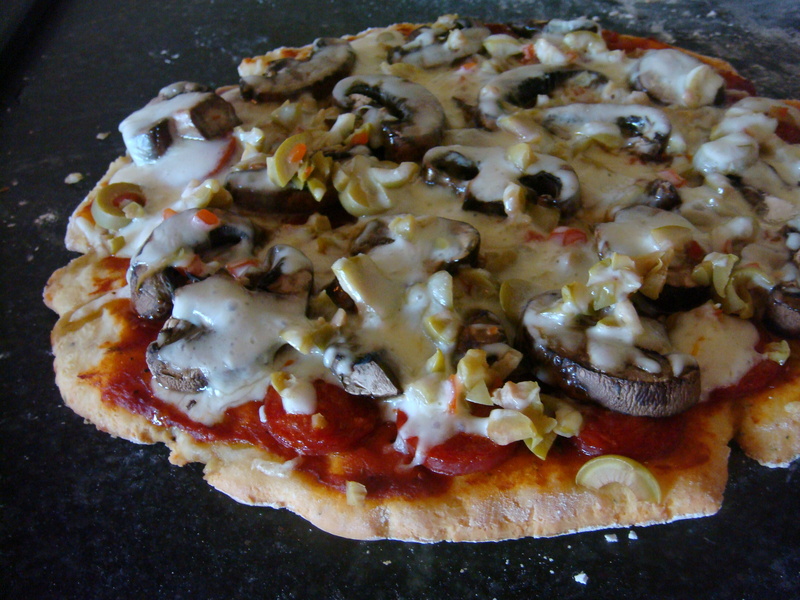 Mix dough with your hands until the cheese shreds are no longer visible and you have a cohesive dough. If it seems too wet you can add a bit more tapioca flour until you get a smooth dough ball. Divide dough into large orange sized balls. To roll out you can either flour your counter with tapioca flour or rice flour or you can roll it out between two pieces of parchment paper, which I think is easiest. We generally make crusts sized 6-10 inches across. Roll them out until they are a bit thicker than a pie shell. I can’t say how it will turn out if you make it much bigger than that. Transfer crusts onto baking pans. You can leave the parchment paper underneath and save yourself the washing of a cheese crusted baking sheet. Bake for about 10 minutes or until the edges start to brown (the center will not be completely baked). When they are at this point you can do one of two things. You can add your sauce or olive oil and toppings and put it back in the oven, still at 350, until the center is hot and bubbly, maybe another 10-15 minutes. Or you can let them cool and then freeze them in ziplock bags. We make the crusts small enough to fit into the large ziplock bags. Then when you need a quick lunch or dinner you can just pull out a couple of pizza crusts, top them and put them in the oven at 350 for 15 minutes or so. Again, it’s done when the center is hot and bubbly. I’ve been wanting to incorporate more fish into our diet. However, I need to broaden my horizons and come up with different ways to prepare it. I will usually make fried fish and chips using Mahi Mahi. I like it because it is really mild tasting and firm so it holds up well when frying. 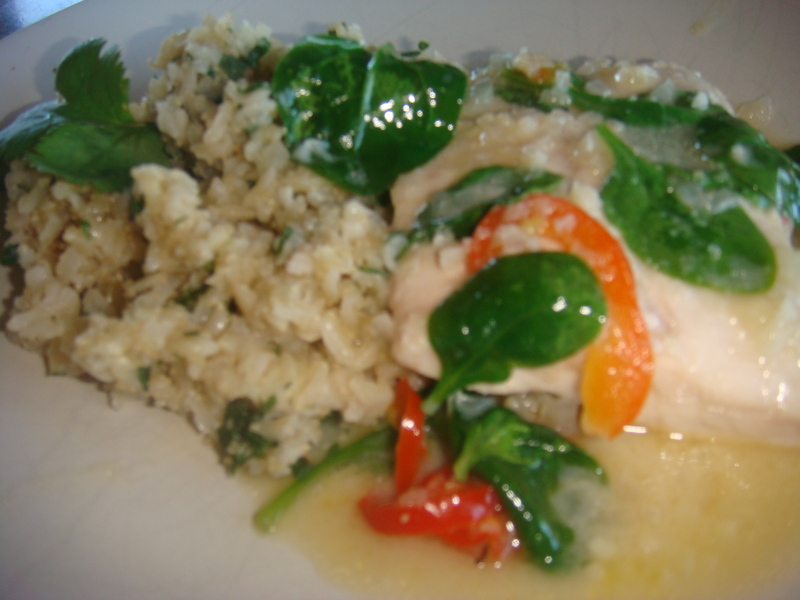 It’s really good that way but recently I tried Mahi Mahi with a Thai flair. It was really really good for those days when you want something a bit lighter than a fried fish. I served it with brown basmati rice, amaranth, cilantro and lime. In a large saute pan heat coconut oil over medium heat. Add minced garlic and onion. Saute for approximately 5 minutes until soft. Add ginger and red pepper. Saute for another couple of minutes. Add coconut milk, lime leaves and fish sauce. Stir to combine. Add Mahi Mahi without overlapping. Spoon sauce over top so that the fish is submersed so it will poach. Cook on medium heat for approximately 10 minutes or until fish is done. Prior to serving mix in a handful of baby spinach leaves and squeeze juice of one lime over top. To serve put one scoop of rice on plate and put fish and sauce over top. Serves 5. In a rice cooker add rice, amaranth and water. When it is finished cooking add salt, cilantro and lime juice.